Birds of the Heath: A sky full of planets! If you have a casual interest in astronomy, just after sunset is a great time to take your birding 'scope outside and enjoy great views of four planets. 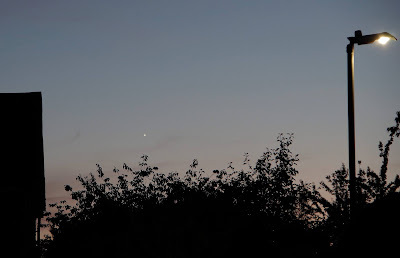 Strung out along the ecliptic (the plane of the solar system that the Sun appears to follow across the sky) are Venus, Jupiter, Saturn and Mars. 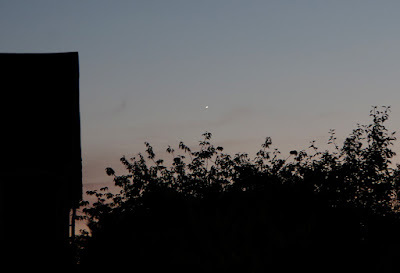 Venus is particularly bright, and appears in the west just after sunset (see images below), while Mars is as close to Earth as it ever gets. Rising in the east at around 9.15pm, it really is a brilliant red object. Even with a spotting telescope, Saturn's rings are visible, while Jupiter's equatorial cloud belts and four largest moons are a spectacular sight.